DEAL OR NO DEAL: Set News From Day Time! 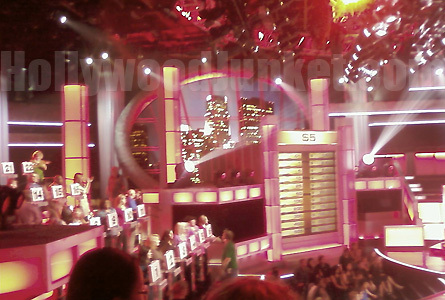 Deal or No Deal, on-set of the daytime syndicated show. 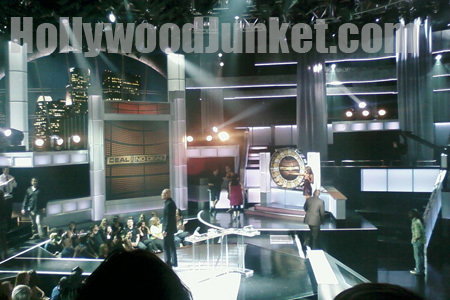 The latest happenings on the set of “Deal or No Deal” syndication filming: One contestant got so riled-up about the Banker’s offer, he slammed the “Deal” button cover down so hard that the cover slipped off of the podium and fell apart. The buzzer remained on the podium, but on its side. He continued the game using the fractured buzzer which still worked. It was a “play it as it lies” situation. Members of the crew worked diligently to put it back together after the contestant finished his game. DEAL’ did special themed “couples” episodes. The first in the series was newlywed couples. Each set of couples stood at the case podiums. One couple selected by the “Deal Wheel” got a raw deal with their cases. Their luck was so bad, they managed to open ALL of the first 10 cases, high amount cases. They were left with the highest option case of $500. Their game was stopped by production after Act 2, and the contestants were sent away with $500. Their episode will NOT air. The show had to let another couple be selected from the “Deal Wheel” to play out a game for television. However, the last game of the day, was struck with more bad luck. Their game ended with the option of winning only $10. According to one audience member, Howie did such an amazing job at saving the show with his comedy skills, it will most likely be aired. The next series of couples shows filmed the next day, was twins. A bit more bad luck. The majority of the twin contestants opened all of their highest cases which in this game, there are only three of them: $100,00; 250,00; $500,000. I doubt that “Deal or No Deal” will be trying the double contestant games again anytime soon. Good news for DEAL’ Model fans – the original prime time game show starts back filming this Wednesday! There was a casting call just last week for “Deal or No Deal” models in Hollywood. So, looks like we’ll be seeing one or two new ladies behind the cases this season. We’ll keep you all updated.